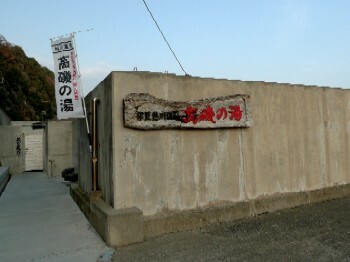 We, party of three, strolled through Inatori, one of major cities in East Izu, on the way home. Despite a four-hour stay, we visited several spots and enjoyed the attractive seaside town. 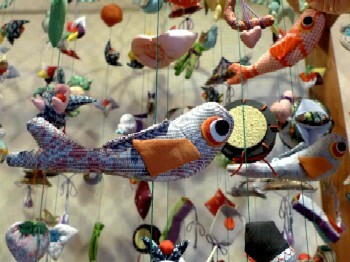 The opening picture shows dolls and hanging decorations for Hinamatusri (the Doll or Girls Festival on March 3). 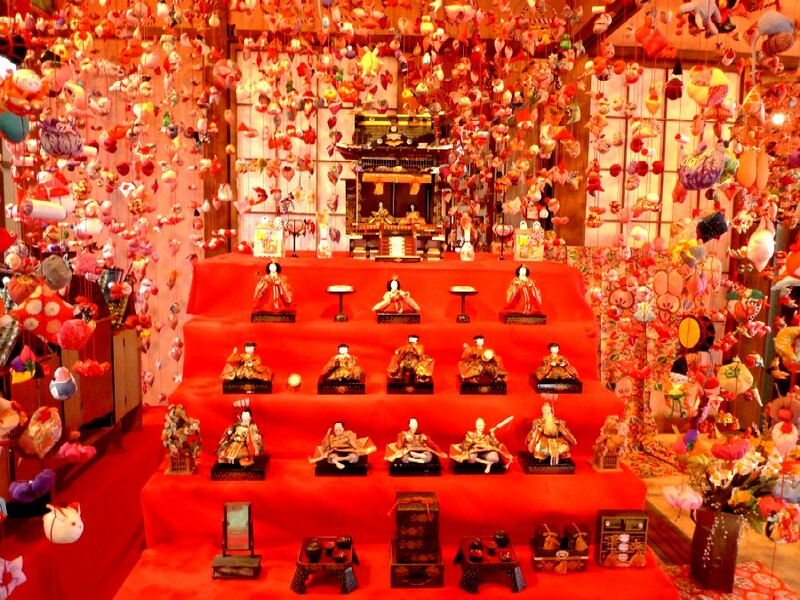 In Japan, many people who have a daughter set up dolls for the festival, but the hanging dolls decoration that’s handed down from Edo times (1603 –1868) is a unique tradition of the area. 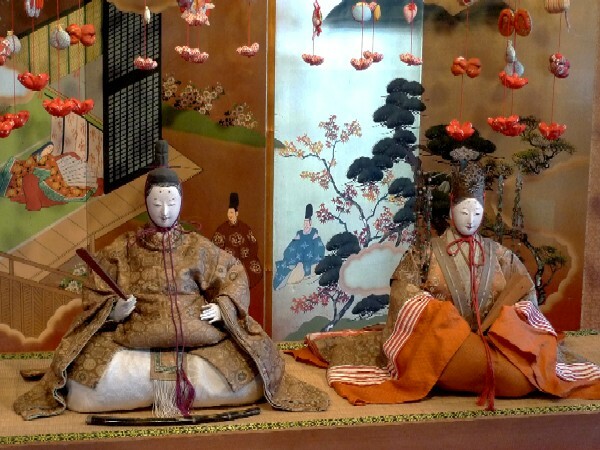 The festival dolls were expensive in the old times, so people in Inatori made ornaments from waste pieces from cutting cloth and hung them to wish for the healthy growth of the child (the festival was originally for both boys and girls). 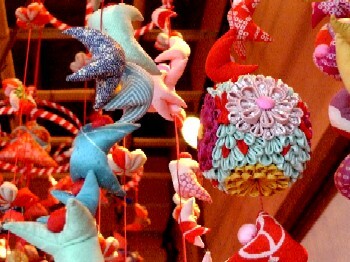 The hanging dolls decoration is one of specialty products of the town now, and the various handmade dolls are sold at shops and stands. 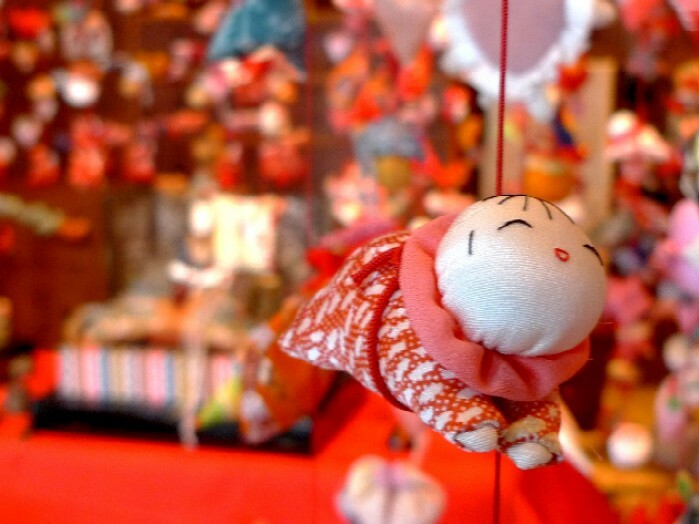 From late　January to end of March, an event called the hanging dolls festival has been held. 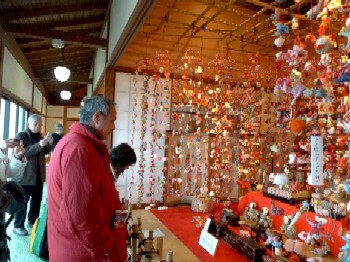 You can see antique dolls and the decorations at exhibition sites. A motif of Haiko (acrawling baby) reflects parents' wishes for their children's growth. Aiming for Kawazu-zakura cherry blossoms, my friends and I went on an overnight trip to East Izu from last Friday. 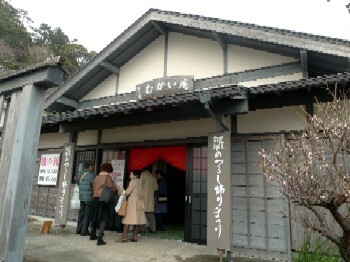 I visit the area during New Years holiday last month with one of the other friends and her mother(the previous post). 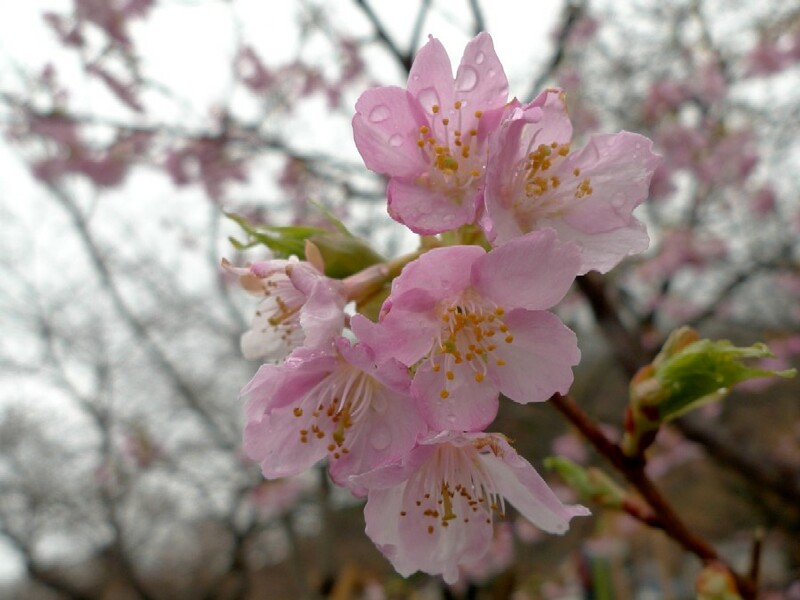 Usually, the cherry blossoms in Kawazu are at their peak in the fourth week of February (so I arrange this trip), but since temperatures have been comparatively low this year, the trees are late blooming. Unfortunately, with the exception of a few, just about two-tenths of the blossoms are in bloom as of yesterday (2.25.2012). However, walking around the town was fun in its own way. The rain stopped when we arrived there, and the station road where many food stands selling various local food was bustling with tourists. 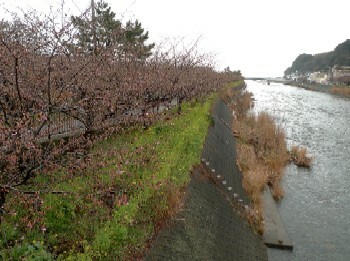 Some of cherry trees along the road were in bloom. 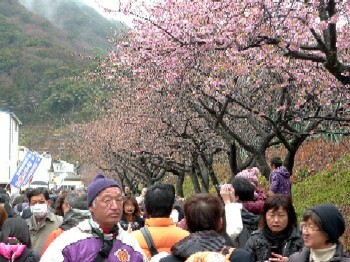 I saw many foreign tourists, and I wished they could see full-blown flowers. 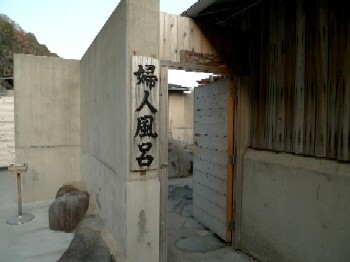 We stayed at a Japanese inn and hot-spring facing the sea in Atagawa. I wanted to take up our lodgings in Kawazu or Inatori (the next town to Kawazu) as I visited Atagawa last month, but inns in that town were all booked up until the end of February. I realized that Japanese really love and go to see cherry blossoms. 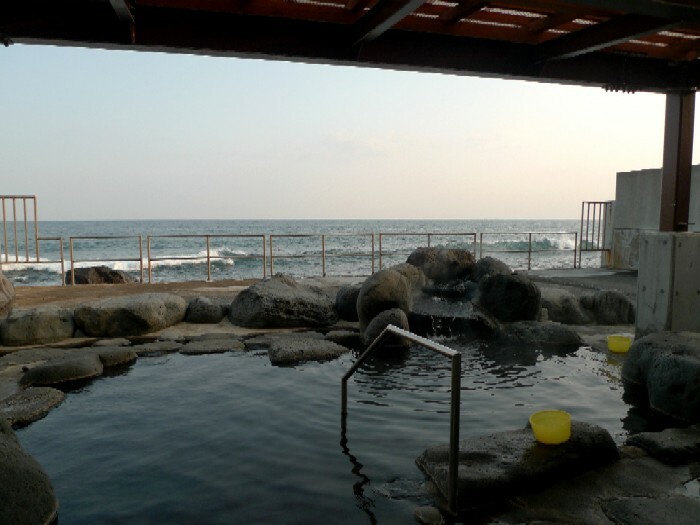 Though the inn had the bathing area with the view toward the ocean, we went to a famous beachfront outdoor hot spring bath called Takaiso-no-yu. I wanted to go to it last month but didn’t have a chance. While a bathtub in the foreground is for female, one in the back is for male. The view and scenery from the bathtub is spectacular, you know! 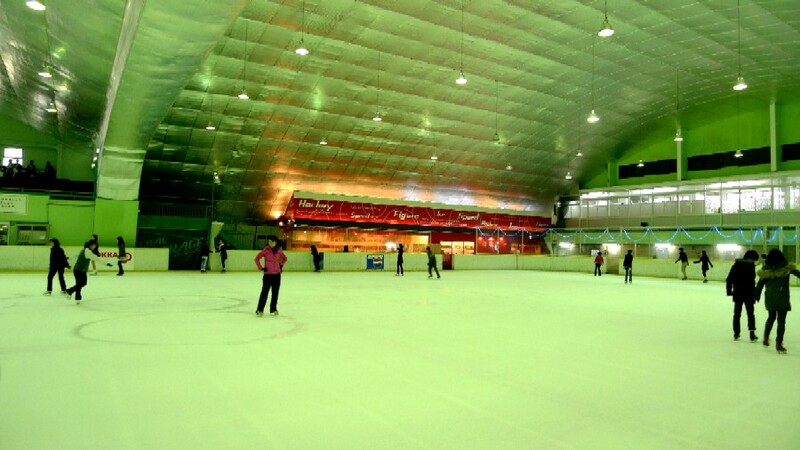 The photo shows the Kanagawa Skating Rink located on the outskirts of Yokohama. After taking the figure skating lesson in Tokyo Midtown the other day, I went there all the way to join a daily walk-up class for adult female. I took another trial class again because I'm still not certain I can regularly go to a skating school. 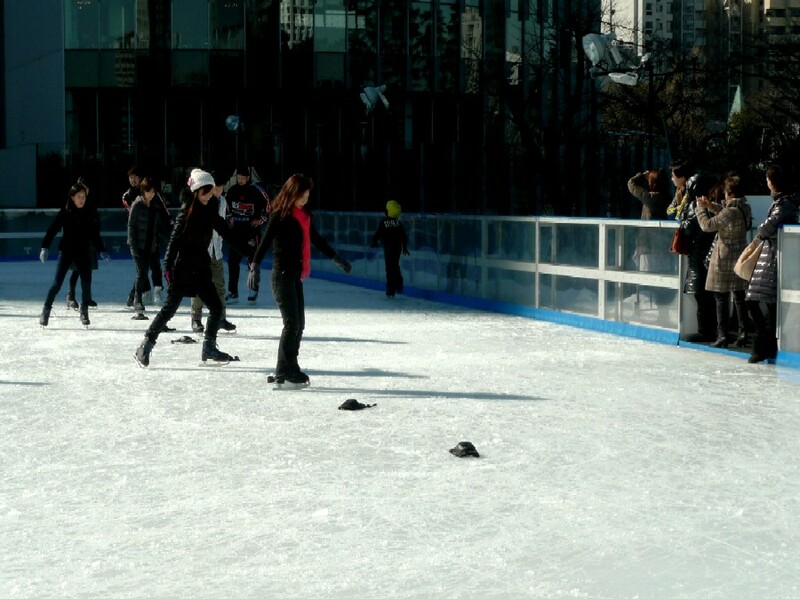 At that time, I saw a male single skater belonging to its club was practicing. That was Akio Sasaki who is going to be 21 years old next month. Most of you may not know his name. Well, though I have a friendly feeling for him now as we spent few hours on the same rink, he didn’t have much of a presence since last Japan Figure Skating Championships when I watched his performance for the first time. I was impressed with his humorous SP with “Ninja” as theme. It can be said that Sasaki’s in the third group in the world's most strong male Japanese team. The first one includes Daisuke Takahashi, Takahiko Kozuka, Nobunari Oda and 17-year-old Yuzuru Hanyu who distinguished himself. Tatsuki Machia, Takahito Mura, and Daisuke Murakami form the second one. Two skaters including him follow those powerful competitors. Above-mentioned 9 are certified male single senior skaters for JSF in this season. Every figure skating watcher may say about his skater, “If his jumps are OK, he can get in higher position”. He delivers his program excellently, has gorgeous steps, and skates well, but he cannot perform triple jumps consistently. He seems to THINKS he’s weak in jump. When more able juniors will start to compete in senior competitions, he would move down on the list…. However, Sasaki has special charms that nobody else has. Using offbeat music, he dances and steps splendidly and conducts unique choreography amusingly - as for these points, he’s absolutely marvelous. Though in the same program, he fails to jump one after another, the audience would be fascinated in his skate that reflects his ideal skating and his cheerful and positive personality. He has many fans. Some of them made big paper ninja stars and threw them into a rink after his performance. According to his interview with Absolute Skating (in English), he’s from a family of commoners, not rich one. Figure skating is a money-consuming sport. His mother worked and financed it. He feels he owe her a lot. 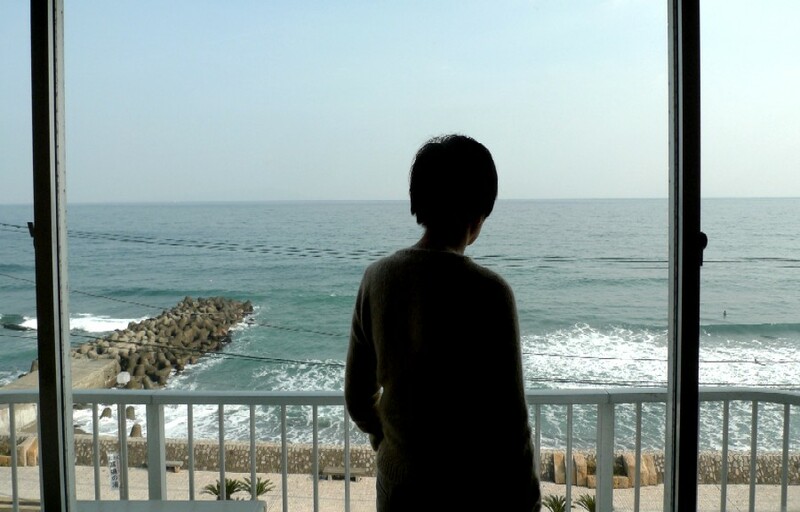 When he entered a university through the recommendation system, he hesitated in the economic burden on his parents. He’s practiced skating at his home rink nearby since he started it. He loves his hometown, family, coaches and the rink. Some skating watchers say that Sasaki has to find a good jumping coach or move his bases overseas for raising the level of skating. That’s maybe right for dragging himself on to the higher position, but everybody has his or her own reasons. I think it's all right if he practices and tries to create his own style in his familiar environment at his own pace. To put it the other way around, because of that environment, he can make his　program with a difference the fans love and performs it as he want. 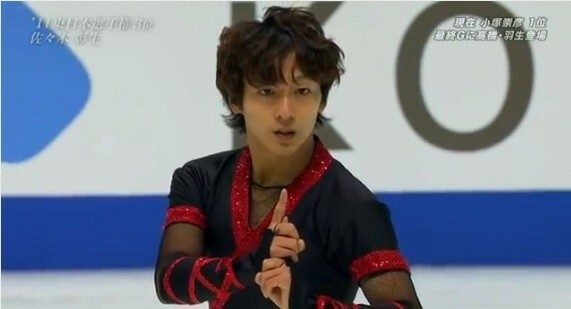 Anyway, the fact is he’s already risen to the sport's higher rank if not a leading Japanese skater. I do hope he will be around as long as possible and show us his skate. I bet everyone would fall under the spell of his Ninja program! I was thinking to write about something, but I changed my mind. 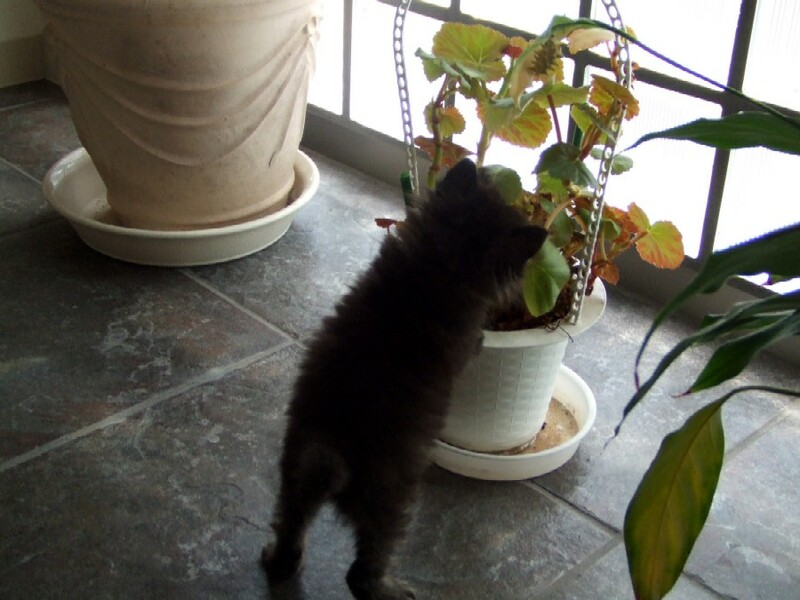 I’d like to write about how I met my cat named Chihuahua (we call her "chi-chi") because when I organize photos yesterday, I found the pictures of herself (it’s female) as a kitten that are absolute lovely. I met chi-chi in front of a bakery nearby seven years ago. The little kitten was crossing the street alone, and then an older lady who passed along gathered her up in arms maybe because she couldn’t stand by and watch any longer. She was weigh less than 200g (I could put her on my palms) and couldn’t see and small anything because of a cold. Despite the lady rescued chi-chi instantaneously, she seemed to have no idea what to do. I come by just in time and watched that scene. The small and skinny homeless cat looked like a Chihuahua puppy viewed from the back. I spoke to the sweet lady, received the poor cat and told her that I would take it to the veterinarian. She was so relieved　and glad that she almost appeared to hand over money. I hadn't decided whether I would keep the kitten yet. I could adopt it since we have vacancies for one more cat. While the enrollment limit was 2, we had one cat at that time (we lost one four years earlier). On the other hand, I thought I could find it a new home because I knew chi-chi was super cute. Then, while I took the kitten to an animal hospital in every two or three days, I started to feel affection for it. Well, that's the way my cat joined the family. Not just women bring their boyfriend or husband chocolate, but giving lots of chocolates for presents in the office at this time of year. Many women give it to give it to their co-workers and superiors, and we call that “giri-choco (obligation chocolate)”. 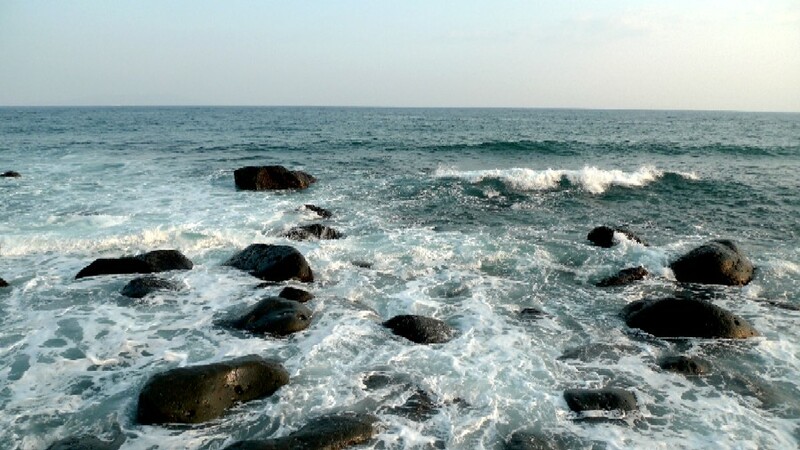 Nevertheless, it doesn't mean that we are unwilling to do this. Japanese like to present something to show gratitude for their favors. Anyway, many men get boxes of giri-choco. I also get giri-choco every year because someone who receives would pass it to me. It’s my secret amusement. Usually, giri-choco isn’t fancy, but for once, I can pick up brand-name chocolate. I suspect it’s an expression of someone’s true feeling, but I accept it gratefully without worrying about if the one was successful confessed one’s love or not. I’m looking forward to what kind of chocolate I will get this year! 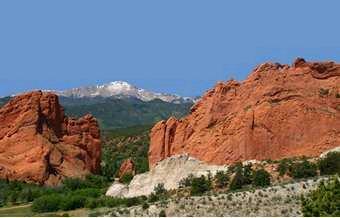 I’m going to keep hours on Mountain Time Zone this weekend because the Four Continents Figure Skating Championships are now held in Colorado Springs! 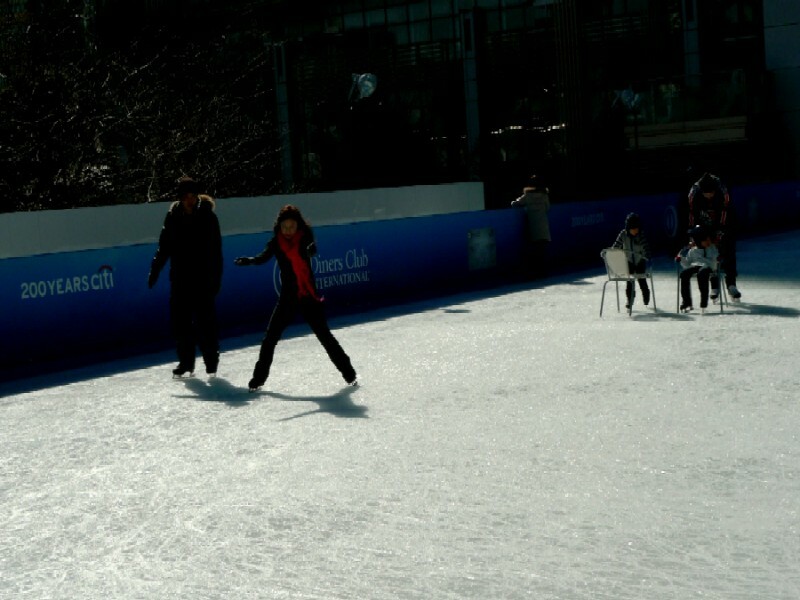 Though I watched major figure skating competitions every year, I may be overzealous in pursing them this year…. Since I created the streaming environment (the new PC and optic LAN), I can watch most of them live. Addition to it, our J-Sports (CS sport channel) also has plenty of live broadcasts. However, I was definitely right about staying home and watching that. The men’s short program took place this afternoon, and I was so imprested with performances by Tatsuki Machida and Takahito Mura! The both did their best. Machida who eclipsed his personal best score was placed 4th behind Takahashi. He got the highest GOE for this 3A, wow! Mura performed beautiful a quad-triple combination jumps. He was the only one who did a quad jump clean and was placed 2nd behind Chan. We have excellent top male single skaters in Japan, so the boys don’t have many opportunities to participate in a major international competition. It’s really important for them to have a strong appeal to the world! I hope they will show their ability to the fullest tomorrow. I raise a topic of figure skating again, but this time, a person on the ice isn’t a famous skater. It’s me! 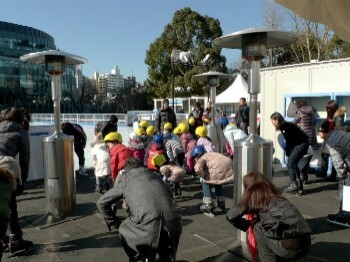 This morning, I joined a figure skating class held at an outdoor ice rink in Tokyo Midtown. 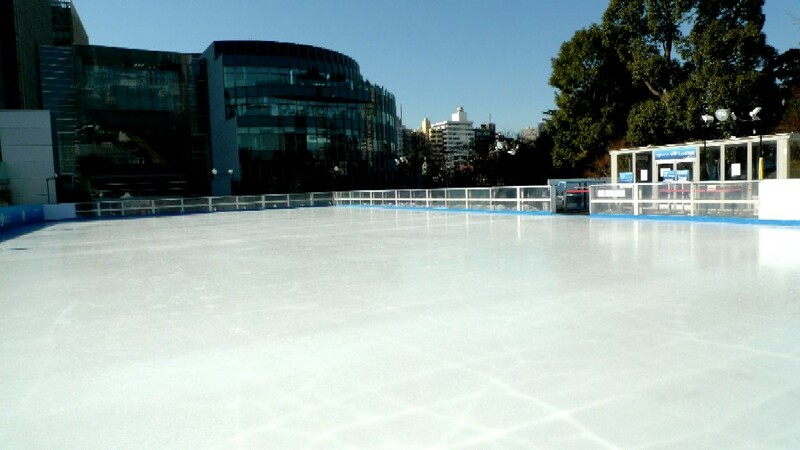 I thought about joining a total of 3 or 4 lessons at White Sacas Alphard rink in Akasaka (I wrote about that one in the previous post, City Rink), but I wasn’t sure if I could participate in all, so I chose this an hour-long, one day program for beginners to intermediate skaters. 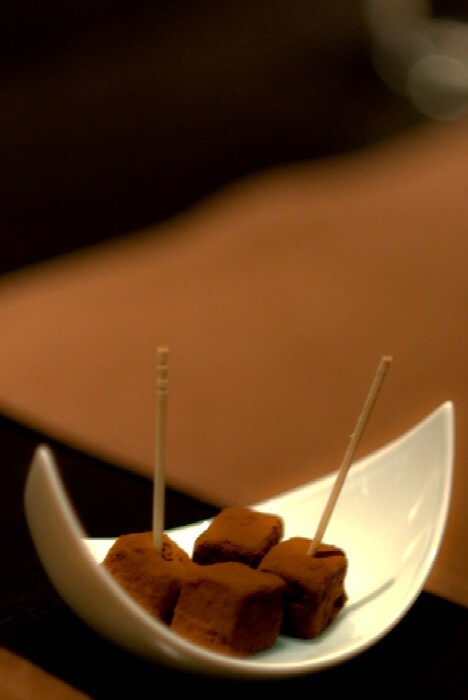 It’s for a limited time (2012/1/7～2/29) sponsored by Diners Club. The most participants were kids, but some parents also joined with their children. I'm glad to find adult fellows. Instructors were a coach and players of an ice hockey team, Ice Bucks. It’s an Asia League Ice Hockey team based in Nikkō, Tochigi Prefecture, which is the only one professional team in Japan. I didn’t know about instructors until I got there (I thought figure skating coaches would teach), but it was Ok because the basic skating skills for beginners are similar in both figure and hockey skating. Even so, I noticed the difference: the instructors had an emphasis on staying low and keeping knees bent. They also didn’t mention much about how to use edges. While it’s always desirable to skate on only one edge of the blade in figure skating, it’s not in hockey skating. When they taught how to turn (the opening photo shows that), they showed us powerful turns and said, “Push the ice, like kicking, with the back part of outside leg’s blade”. I couldn’t follow it, so I translated it, by myself, into how I have to use an edge and tried. I voluntarily practiced for a while after the lesson. 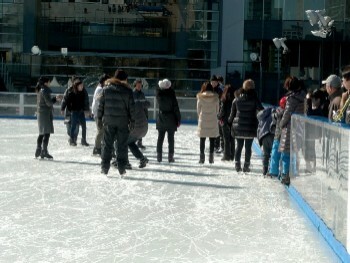 It’s really fan to skate feeling the wind. Why don’t you go to an ice skate rink near you? Judging from the costume, the photo might be taken in 2007-08 season. 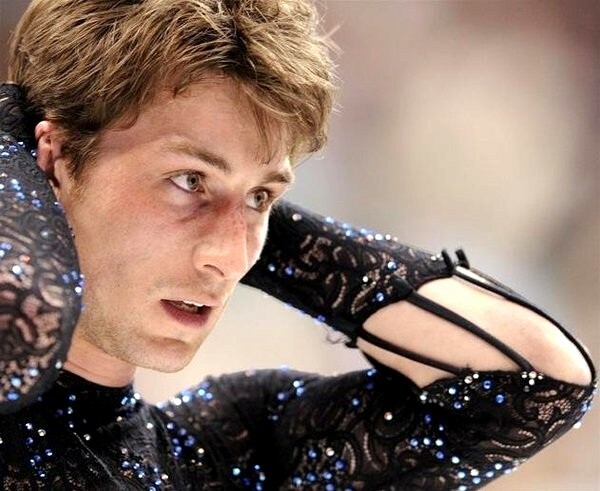 The good-looking guy with a disheartened look on his face is Brian Joubert, one of skaters I watched holding my breath last weekend. He’s popular in Japan, so I think some of you know him. The French skater is the 2007 World Champion, a three-time European champion, an eight-time French National champion, and the 2006-7 Grand Prix Final champion. At the same time, the 27-year-old man may have passed a peak in the domain of male single in which one’s prime is from late 10s to mid-20s. Since 2009-10season, he has lost his luster partly due to injuries. His melancholy eyes have stuck out in my mind for several years. However, I think he’s still a top skater who can stand on the podium. I guess his problem, at least late years, is that he’s no hand at emotional control during performance: he’s easily depressed when he fails, cannot recover and repeats mistakes at worst. He detonates oneself. In his short program at European Championship, after missing first quad jump, he stepped out second triple axel and couldn’t put in a combination jump that’s one of required elements for SP. Then, I saw his depressed look again. He was in 10th place after the short program, and the podium was already out of reach. 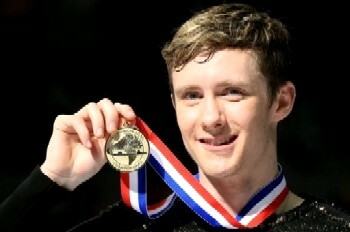 The others I watched on TV with bated breath were a 29-year-old Russian, Evgeni Plushenko and a 26-year-old American, Jeremy Abbott. Though I don’t closely mention them because it’s going to be a long story, I saw their exultant faces unlike Joubert. 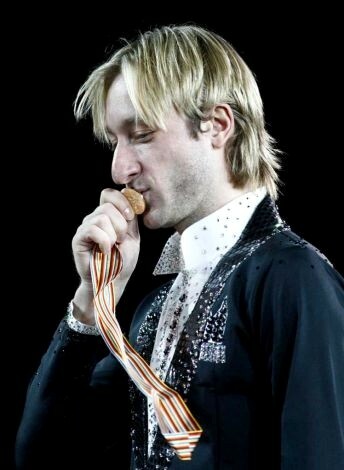 Plushenko (left) and Abbott (right) won the gold at Euro and American national respectively. This handsome skater who is basically a man of spirit and also fragile easily wins over ladies. Not only that, his masculine and dynamic performance including huge quad jumps is popular among male fans. I believe his depressed look affect both male and female. Last weekend, many people who back up him couldn’t help but sigh deeply in the arena and in front of TV or PC. He would participate in the World championships in March, but I don’t how many times he appears at major international competitions in the future. Though his melancholy eyes aren’t bad, I hope I can see joyful Joubert as many times as possible.